Lip balm, we all have it. We all have one or two or six in our purses or our cars. We've all had a few go mysteriously missing, then we shrug and just buy a new one. 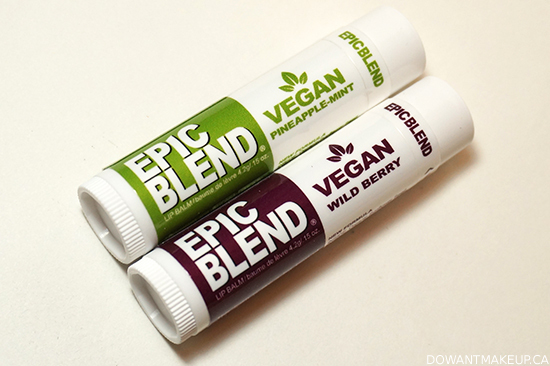 Unlike the random lip balms I pick up while waiting in checkout, I'd definitely go into a panic if my Epic Blend lip balms went missing! 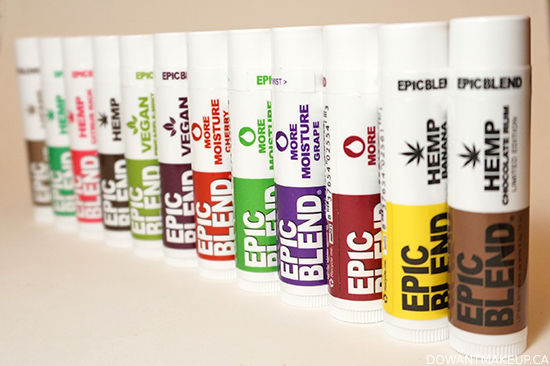 Produced in Kelowna, British Columbia, Epic Blend lip balms feature a base of fantastic skin-conditioning ingredients such as sunflower seed oil, cocoa butter, and coconut oil, as well as Vitamin E and rosemary extract (based on Cosmetics Info, my guess is it is there for antimicrobial or antioxidant purposes). I have the great luck to have both super chronically dry lips and eczema around my mouth--i.e. extremely sensitive!--so I am a bit picky about my lip balms. Previously I was using La Roche Posay Ceralip, but my Ceralip tubes have been left by the wayside since I started trying Epic Blend balms, available in Hemp, More Moisture, and Vegan formulas. 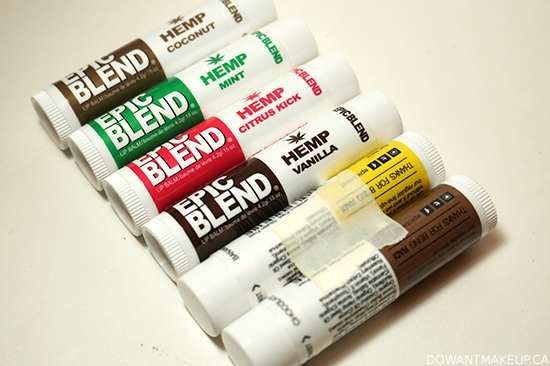 Of the three formulas available, the Hemp balms come in the widest variety of flavours: Coconut, Mint, Citrus Kick, Vanilla, Banana (limited edition), and Chocolate Rum (limited edition). 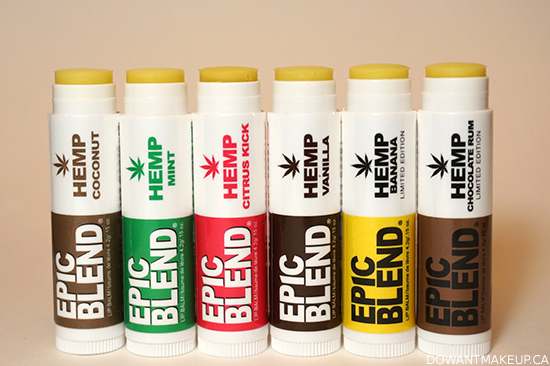 Epic Blend Hemp balms feature hemp seed oil, which a cursory Google search indicates has emollient, occlusive, and anti-inflammatory properties. Citrus Kick is one of my favourites in particular, because I love the zesty, refreshing scent derived from grapefruit and sweet orange essential oils. I have a few chocolate lover friends who are fans of Chocolate Rum, which has a convincing and not cloying chocolate scent. My favourite formula of all is More Moisture, which comes in Cherry, Green Apple, Grape, and Unflavored. These balms include castor seed oil and shea butter--that's in addition to Epic Blend's base formula of sunflower seed oil, beeswax, cocoa butter, and coconut oil, so you get an incredibly moisturizing lip balm! More Moisture balms have the most "slip" due to the number of moisturizing ingredients so they glide on super smoothly, but it's best to blot your lips first or use a Hemp/Vegan balm instead if you are applying lipstick on top. Bonus: the Grape flavour smells delightfully similar to a grape Jolly Rancher. For the Vegan balms, Epic Blend removed the one non-vegan ingredient from their formula, beeswax, and replaced it with candelilla wax. These balms come in Pineapple-Mint and Wild Berry and have the least "slip" but were still very comfortable to use on my sensitive lips. 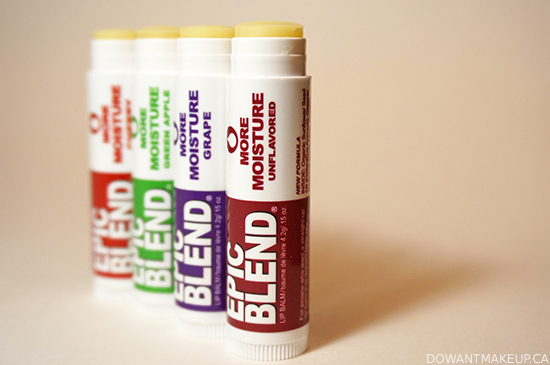 Maybe it's weird to be this into a lip balm, but I'm thrilled that Epic Blend let me try out their line and discover how hydrating and softening their balms are. I have one in my purse, one on my desk at home, one on my vanity, and one in my drawer at work so I'm never without some epic moisturizing powers. With all moisturizing and beneficial ingredients packed into each balm, I expected the price point to be much higher but it's surprisingly just $3.49 CAD for one balm (or $12 for a four-pack)--that's less than my Starbucks go-to grande London Fog! So basically this is a product that works incredibly well and is cheaper than a coffee/tea beverage--what are you waiting for? Go forth and have epic lips too! Final note: Epic Blend recommends using a balm within a year of opening due to the paraben-free formula, which won't be a problem for me since I'm always reaching for them. Which formula/flavour would you try? Do you have a favourite lip balm? If you follow me on Instagram and Twitter (if you don't, why not?? ), you might have noticed a bunch of new beauty news on my feeds last week! That's because I was attending this year's London Drugs Beauty Event, an annual press event to showcase some of the new makeup and skin care products coming to London Drugs. Last year I also took lots of photos, but just never got around to posting about it until it was just way too late to bother. This time around, I saw so many cool and interesting things coming to London Drugs this summer and fall so I absolutely had to share the info with you all. I had an exciting start with a helicopter ride to event. It was my first time on a helicopter and so cool! 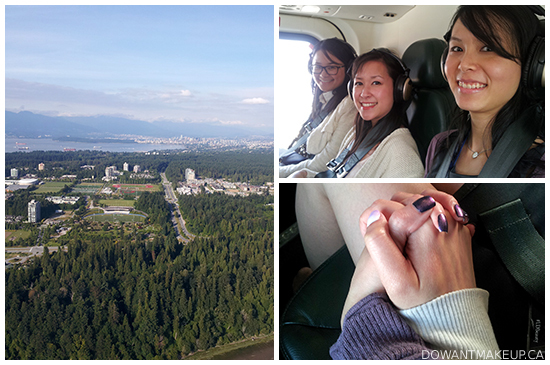 Bf was extremely jealous ψ(｀∇´)ψ Left: a view of University of British Columbia; top right: my flight-mates Sheila, Jordana, and Jayne; bottom right: holding Jayne's hand. Now, on to the actual event--warning: very pic-heavy ahead! 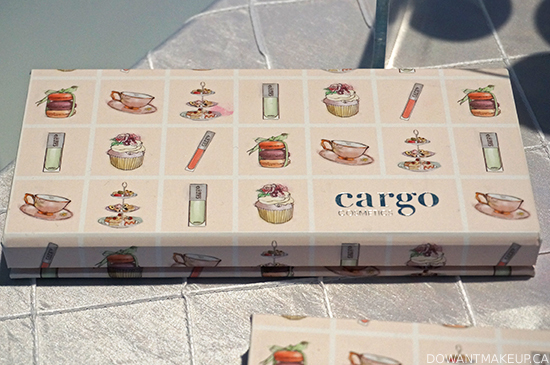 New this year and available now is the Cargo Suited To A Tea eyeshadow palette ($46 CAD). Despite my current eyeshadow purchase ban, this palette definitely appealed to the tea lover in me with the cute packaging and high tea-inspired names like Crumpet, Petit Four, and Earl Grey. 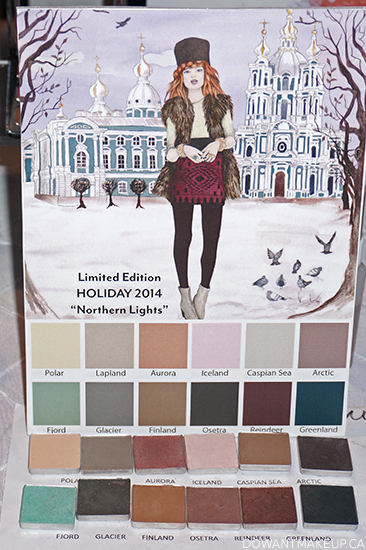 Due out in Fall 2014 is the Northern Lights eyeshadow palette with a mix of icy-pale and deep, neutral shades. 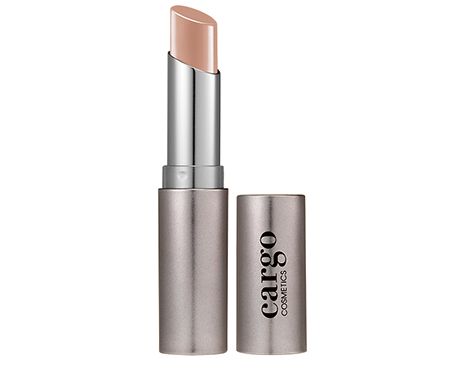 The upcoming Cargo Matte Top Coat (Fall 2014) was definitely an eye-catcher. Similar to how a matte top coat can change any nail polish to a flat finish, this product does the same for lips and creates a matte finish on top of any lipstick. Red Carpet Manicure specializes in LED light-cured gel polishes in 72 shades at London Drugs. I totally drooled over this display of all their shades. UPDATE September 10, 2014: People have been commenting and emailing me to let me know they haven't been able to find this in stores. I admit I panicked briefly, but had faith because I know this is one of Marcelle's most popular products. I recently received news that Marcelle Essentials Soothing Cleansing Water has been repackaged in a 300 ml bottle with a well pump as Marcelle 3-in-1 Micellar Solution. Yay! 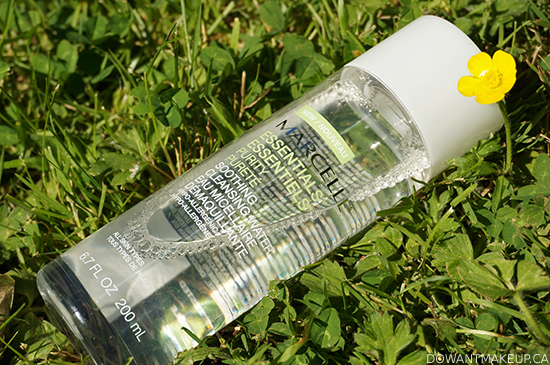 Hey there, Marcelle Essentials Soothing Cleansing Water. We've been going steady for about four years now, and I just want you to know how special you are to me. You've been with me through thick and thin, good skin days and bad skin days, and I'm ready to tell all our friends about us. Marcelle debuted Soothing Cleansing Water, part of their Essentials skin care line, about four years ago. It was touted as a no-rinse "3-in-1" toner lotion, eye makeup remover, and facial cleanser that caught my attention as it made the rounds on Canadian beauty blogs. I'm glad I snapped it up back then, because I've probably saved a lot of money over the years in half-used, not-so-great makeup removers! The relatively gentle and no-rinse formula was especially helpful after my corrective laser eye surgery two years ago. In my post-operative care, I was strictly warned against getting any water in my eyes, which meant washing my face the conventional way was out. A Cleansing Water-less person might start worrying about the effects of going face-unwashed for weeks but I didn't even blink, because I knew I had Cleansing Water at home. My skin continued to be completely normal and blemish-free during the time when I was using this exclusively to cleanse my face. Last year, I committed to being one of the bloggers participating in Annabelle's 24 Days of TwistUp swatch-a-thon. My package arrived from Annabelle and then--awesome!--the eczema around my mouth exploded into a flare-up that meant my lips would be extra sensitive. Thanks to a great formula in the TwistUp lipsticks, my lips didn't get any worse. When it came to removal, Soothing Cleansing Water and a cotton swab was the perfect choice--it took everything off easily and quickly (even the more pigmented shades) without the excessive rubbing or ingredients that would further irritate my lips. To use, simply soak a cotton round or ball with the liquid and gently sweep over your face, hairline, and neck. I personally use this as a follow-up after a conventional face-washing cleanser to remove left-behind foundation and eye makeup, but it can definitely be used as a main method of cleansing for many people. I don't wear long-wear foundation or very heavy makeup, so I can't say how well this would remove that type of makeup. The old bottles used to have a lid that popped open to reveal a small rectangular opening to pour the Cleansing Water out from (I use mine now to hold rice bran oil for my face.) I prefer the new design way more: you just twist off the large white cap completely and quickly upturn the bottle for a second on to a cotton pad--much faster than letting it trickle out of the opening! Not sure why it took me so long, but after roughly four years and counting of loving Marcelle Essentials Soothing Cleansing Water, I've finally reviewed it here. Maybe because I love some products so much, I feel like I need to think about it a little so that I don't just publish a post with the words IT'S AWESOME and a picture--but anyway you need this in your life, like, now. It's perfect for anybody; if I had to give a beauty product recommendation without knowing anything about that person or their skin type, I would recommend this. It really is an essential product to have. 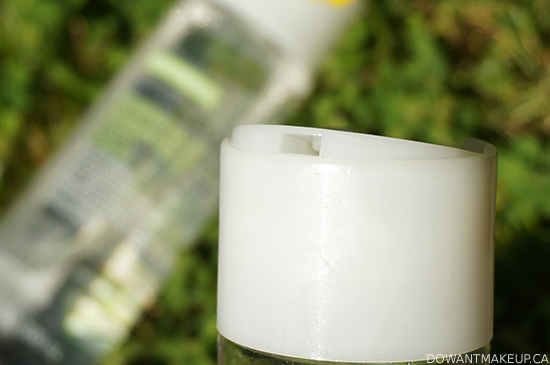 Do you have a skin care staple you've been using for years?